Welcome to another exciting episode of The Creative Marketing Zone Podcast! I am your host and chief creative officer, Eric, and this is the weekly podcast for all things creative to help you build and grow your business! Jason is the Founder of Break The Web, a hybrid digital marketing agency that builds traffic generating campaigns. Paving the way with SEO, Break The Web has grown from the one-man SEO freelance operation in 2009 to 15-full time team members from around the globe. They have strategized, implemented & consulted with over 150 brands, ranging from your local flower shop to the nationally recognized Fortune 500 companies. 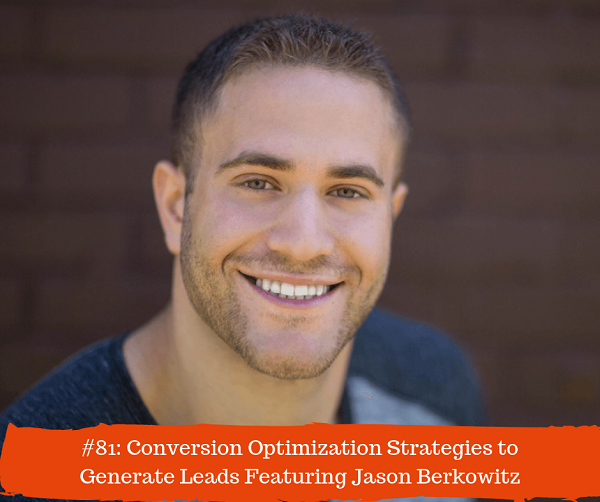 Today Jason is here to talk more about conversion optimization. He will go over some simple and creative conversion tactics designed to convert visitors into leads. Now, if this is your first time tuning into the awesomeness of the show, then welcome! I am super thrilled you are here. Tuesday’s is when I release a new interview with a marketing guru sharing his or her ninja tips to help you grow your business. And on Friday’s I release a solo episode on something new I have learned that works, doesn’t work, or some general creative marketing tips to help you grow professionally and personally. Speaking of the Friday episodes, we are rocking and rolling with the five-part series on 5 unorthodox tips to help you discover and unleash your creative superpowers! This has been a lot of fun to put together, and if you haven’t checked out that series yet, then certainly do so after tuning in to today’s episode – lots of good stuff being unpacked there! For all you repeat listening friends of the show, welcome back! I am as always super elated that you are here ready to learn some new stuff wherever you are. If you haven’t already done so, then be sure to smash that subscribe button on your favorite podcast listening player so you can stay tuned to fresh weekly content. And if you are totally up for it, then definitely leave me a review on iTunes under The Creative Marketing Zone Podcast. As you know, reviews are important to help bring in more awesome creatives, like yourself, eager to learn and implement some new tips to elevate their business. And if you leave me a review, let me know by emailing me at Eric@TheCreativeMarketingZone.com. I just may feature your review on a future episode, like what I am about to do now. Thanks so much, and yes I do love to have fun on the show. I have told this story on several episode now on when I first started my podcast and how nervous I was behind the mic. I was literally sweating profusely under my armpits and was heavy on the ums and ughs. But now, after 81 episodes in, I am totally comfortable and having fun with this. So, I am glad to hear that you are hearing some of the fun that goes on with these interviews as well. Without further ado, let’s welcome Jason to the show!